UK Super Pro ET racer and Eurodragster.com News sponsor Derek Flynn says that his Gold RV Racing team has just about recovered from last weekend's Easter Thunderball disasters. "I heard a pop followed by another one of my infamous tinkles and then a warm and wet feeling as the car caught fire and the fire crew put it out! ", says Derek. "I would like to say a huge thanks to the fire and safety crews at Santa Pod, you are all truly first class. No sooner had I got out of the car - and believe me I was out like a shot - the fire marshals were there and the fire was out. They even apologised for getting me a bit wet, as I stupidly stood opposite them busily squirting water! "We now believe that the sequence of events was that the torque converter failed and overheated allowing the revs to rise above normal and then one of the blower rotors failed and came out the side of the blower (as the burst panel did not go, nor did any of the ally studs which hold the blower on). This allowed the fuel to go everywhere and put bits of the blower into the engine, holding a couple of valves open which then ignited and the resulting fire burnt out the front pump seal and hence the gear box oil fire. Apologies to Rick Cooke who apparently saw it all unfold in front of him and was a little to close for comfort and had to back out! Also apologies to all the crew who had to clear it up and to my competitors who obviously got delayed. "Once back at the pits we assessed the damage and after a couple of hours it was decided we could rebuild it, mainly due to the quick actions of the fire crews which meant nothing was seriously burnt apart from the converter. Amazingly the bottom end was fine and not too much damage to our new heads, we had spare heads which would save a little time and we were just discussing where we could get a blower from, as Mark Flavell's team reckoned our blower was a little beyond even their welding capabilities when in came two saviours, Clive Bush and Andy, who said "We have got the same blower, you can borrow that if you like, only problem is it is in Devon"! They said to let them know before it was too late as Clive's wife would put it out in the camper so we could collect any time in the night, just don't wake the wife! "OK, if we can now get a converter, and the team are happy to thrash most of the night and tomorrow morning, we could make eliminations tomorrow afternoon. A quick trip over to Jeff Bull and he had a converter which would probably do the trick, the only problem was it was at his workshops in Colchester. He telephoned Steve (sorry don't know his surname) who had already been to Wales the previous night to get a box for Ian Tubb and was on his way home only to be asked back to collect some keys from Jeff and collect the converter for us in the morning, again many thanks guys. "This is where the Gold RV Team really stepped up to the plate and put in a superb thrash to strip the car, engine and gearbox down and then rebuild it all, thanks also to our honorary team members Lee and Richard of J&W Automotive (Bob Glassup's crew) who also helped late into the night. "Words cannot express how proud I felt of the team when we fired up in the pits, and when we pulled down the fire up road it felt like I was on a magic carpet pulling down through some of the other classes to tag on the end of Super Pro. The amount of comments we got suxh as "We didn't think we would see you out again" and "Congratulations" was reallyup lifting, although I must admit to feeling a little apprehensive. Had we missed anything? Were all the fittings tight? I should not have worried though as the majority of the team work for Gold RV and fixing most things American is what we do best, although for any customers reading this, no we cannot collect all your spares and rebuild your RV's engine and gearbox over night! "So now it was time to run. We totally overpowered the launch and shook really bad as the new converter hit hard at nearly 5000 revs. I had to pedal it twice and then it flew, 7.4/191, well done guys absolutely awesome! It was decided that we would launch without using the transbrake for eliminations which got moved to the next day, so we all enjoyed a good night's sleep. We had no idea what time the car would do, nor had I ever launched without a transbrake before and I must admit I was terrified of pulling a cherry after all the effort the team had put in. It launched hard and straight with our first sub-one second sixty foot and our quickest and fastest eighth and I knew I was really on one. I think we overtook Vince Gibbs at the eighth, I got out of it very early but alas still broke out with a 7.0 and less speed at the stripe than we had at the eighth. "Even though we were out, we all had silly grins on our faces at the top end collection area and we just can't wait for the next event where we hope to finally nail that double deuce! "Once again thanks to everyone for their help and support, it was very much appreciated. 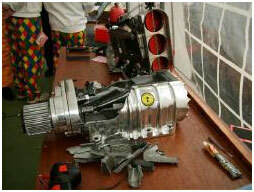 We had numerous visitors to our pits wishing us all the best and amazed at the state of our blower! And again thanks to all the crew at the Pod who ensured we still had a car to fix."